Quick recap of the rules: You must like the facebook page of the person who contributed the prize, and you must like my new page, Nomadic Needles. Leave them a nice comment on their page (and you could even mention that I sent you!). If your name is drawn and we find that you are not a fan of the page, then you will be disqualified and another name will be drawn. After ‘liking’ their page, you may leave a comment under the post about their prize and you will be entered. If you subscribe to my blog, fantastic! I should have no problems contacting you if you win. However, if you are not subscribed and post anonymously I will not be able to find a way to contact you, so please leave your email address in your comment! Names will be drawn on January 14th at 9 pm central time, so you will have to tune in that day to see if you are a winner! Our next contributor is Sew in the Mood. This shop is new to facebook so really show her some love! On this page you will find all kinds of unique gifts for big or little kids. One lucky winner will get to choose ONE of these two rag quilt sets, Girly Skulls or Zebra!! 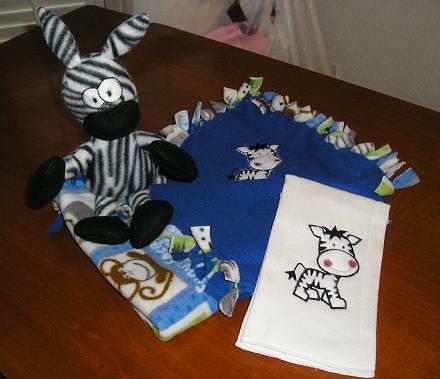 Zebra quilt is made with fleece and is 32in x 23in and matching zebra is 16 in tall. Girl skulls quilt is made of flannel and is 26in x 26in. The girly skulls also comes with a coordinating burp cloth that has a heart and crossbones. Each set is up to a $40 value. So please go ‘like’ Sew in the Mood, and then leave a comment under this post so you can be entered to win. If you have not subscribed to my blog and post under anonymous I will not be able to contact you if you win…so be sure if you post anonymously to leave an email address 🙂 Good luck everyone! Super adorable! Love the zebra set! 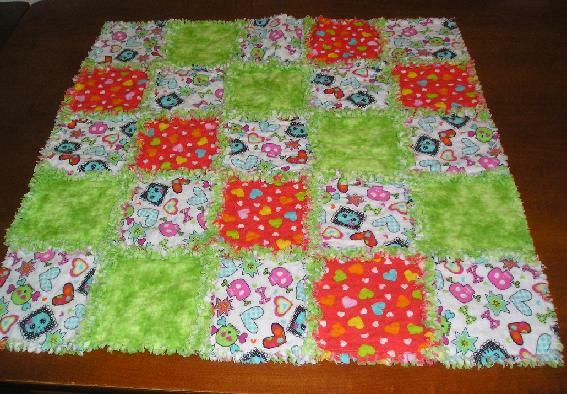 Rag quilts are so cute!! I really appreciate your nice comments. Thank you. I will ask the woman who made this and let you know! But if I had to guess I would say a local Joanns. Katie’s guess was correct! I did buy the skull fabric and matching orange hearts at the Joanns in Denton, Texas. I purchased it last summer and have not seen it since…I just checked their site and this is the only girl skull stuff I found. I also went to ebay and typed in skull flannel, but did not see any of it. I wish I could send you a link to it, but I am sorry that I could not help find any.